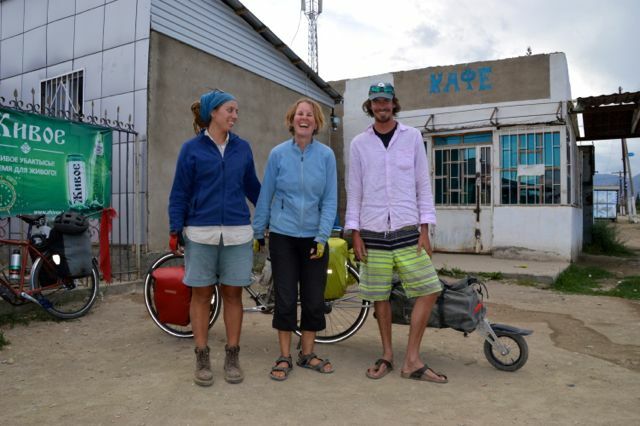 Bidding farewell to our new friends at Nomads Home we cycled to the ‘bus station,’ which is a slightly misleading term in Kyrgyzstan. Sure, there is bus station and normal sized buses do leave from there, but by far the majority of transport is private cars and mini buses, which leave when full (or you pay for the whole vehicle). Obviously this presents a problem to the budget traveller with a bicycle. 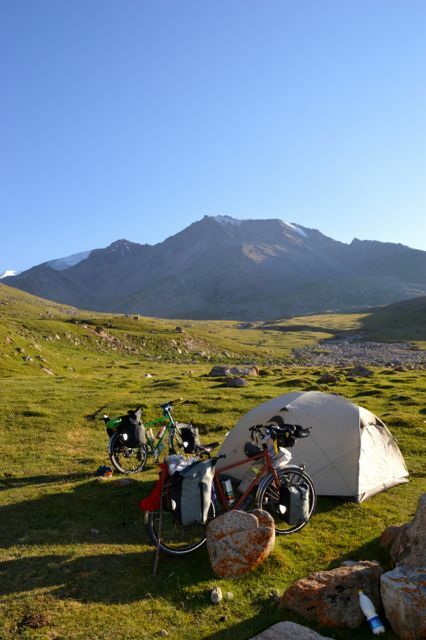 And of course we would rather have cycled the whole distance but due to needing to get visas in Bishkek and the weather in the Pamirs, some compromises needed to be made. 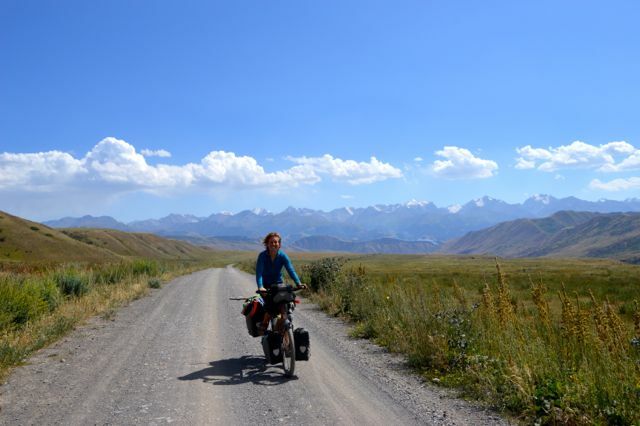 Our plan was a leisurely cycle back to Osh. 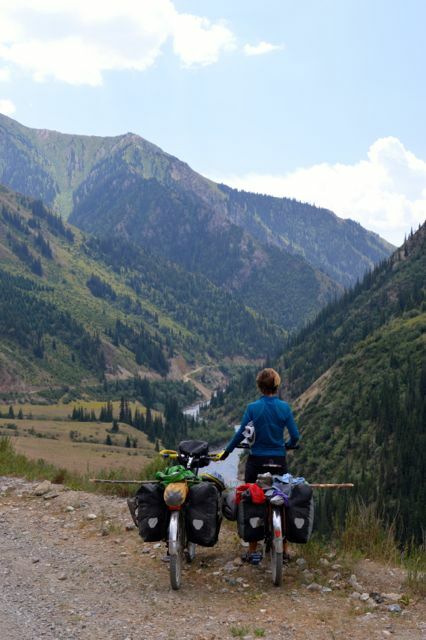 Unfortunately we were soon to come face to face with the true nature of Kyrgyzstan’s ‘roads’ and our trip would be anything but leisurely. 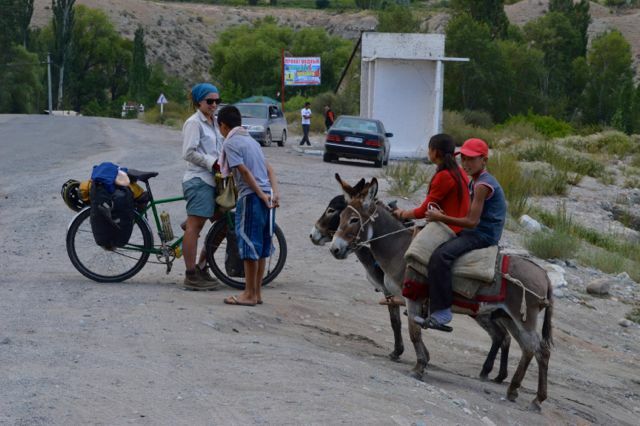 Kids hang out on donkeys instead of bikes here! 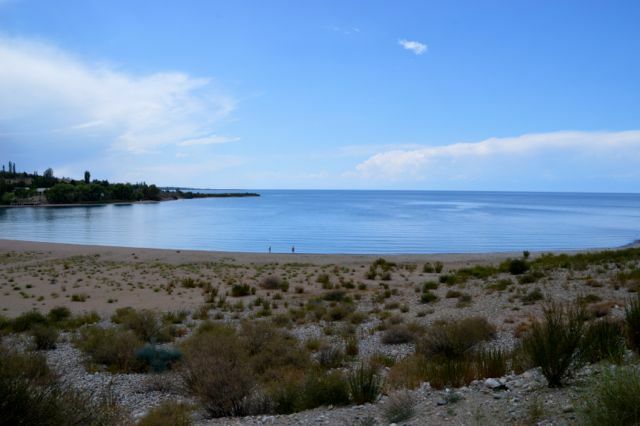 After some negotiations we managed to secure a car for a reasonable price and were whisked off to Karakol, a town on the eastern edge of Lake Issy Kul. The drive was predictably nerve wracking. The Krygyz are yet another population of crazy drivers. We found ourselves deposited on an immense lake, shining a brilliant blue in the sun and surrounded by snow capped peaks. 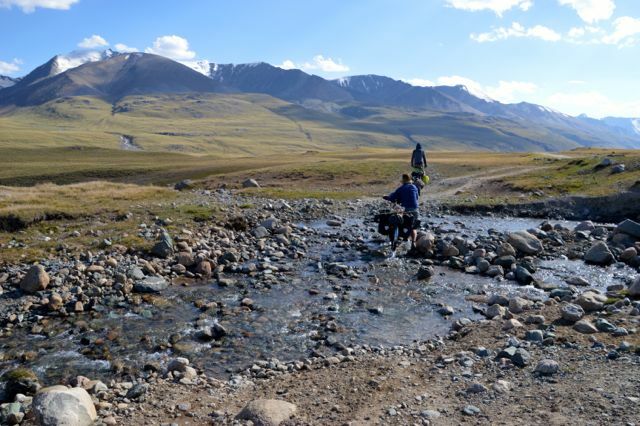 The area is popular for hiking and horse treks and we enjoyed watching a group of returned hikers shot vodka and dance to Russian pop music while having dinner. I kind of wanted to join in as they looked like they were having a lot of fun. The next day we packed up our tents and headed closer to the lakeshore. 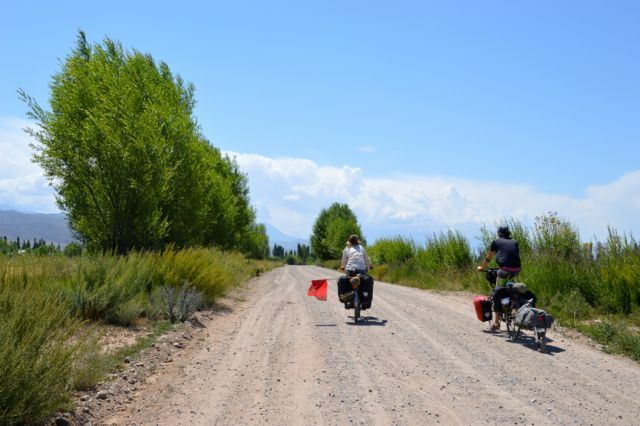 After months of sleek Chinese roads and the deserted roads we first encountered in Kyrgyzstan, we were in for a shock. 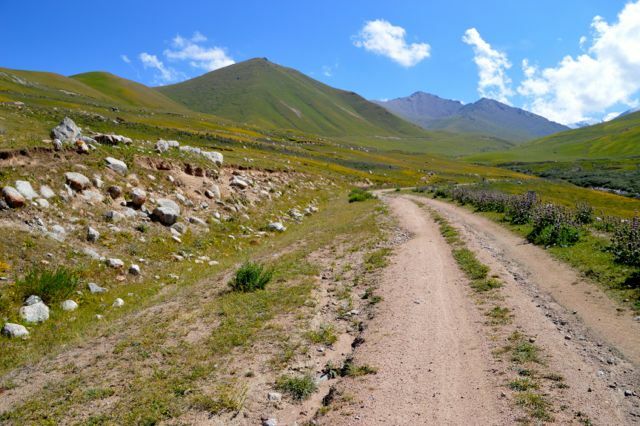 The road around Issy Kul is narrow and badly paved, the traffic fast and drivers careless (and often intoxicated). Taking advice from cycling friends we met in Lao (Alleykat) Astrid and I secured big sticks to our bikes with a big red cloth on the end. This made the drivers take notice and give us enough space. 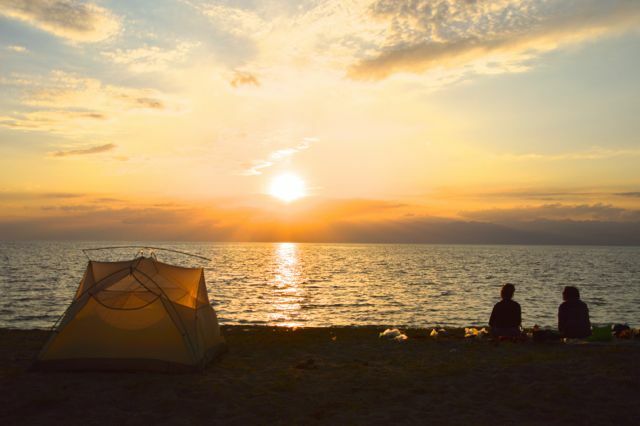 As we got closer to the lake, we decided we would turn off and try and find a place to camp near the water. Some local kids on bikes helped us negotiate the back roads to the lakeshore. Unfortunately it was full of families, volleyball and music. Not really what we had in mind. However, after some bush bashing we managed to find a quieter spot and settled into a relaxed afternoon of swimming, reading and napping. After China, it felt like we were on holiday. 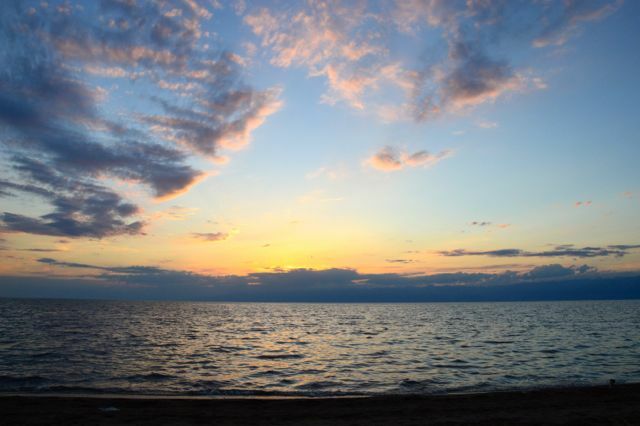 Sunset lake Issy Kul. The holiday vibe is alive! The holiday spirit continued the following day, we stopped for lunch at a Kafe and then made camp on the lake shore again. It was more remote now and only a few people came down to swim in the afternoon. Taking a leaf out of the locals book, we shared some vodka ($2 a bottle!) 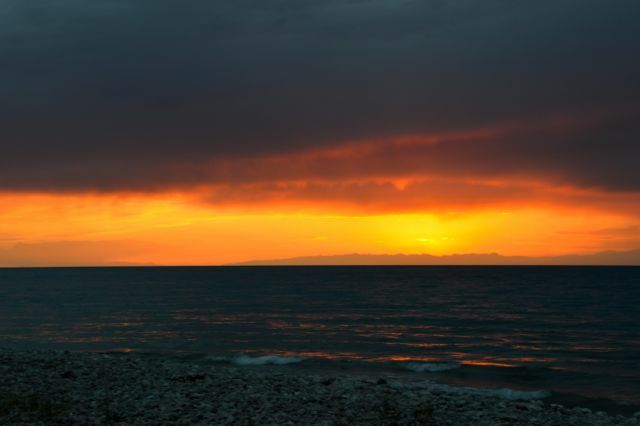 and watched the sky turn a brilliant orange. Some boys joined us and enthusiastically built a fire. Life was perfect. We hadn’t cycled far but felt that this was okay, our target was only 55km a day and we could easily cycle more than this if needed. Or so we thought. Another night on the lake with some locals. The day started with an early morning swim, followed by cups of tea and eventually we packed up and cycled the short distance to Barskoon. Here we met up with Jan, a friend from Nomads Home. 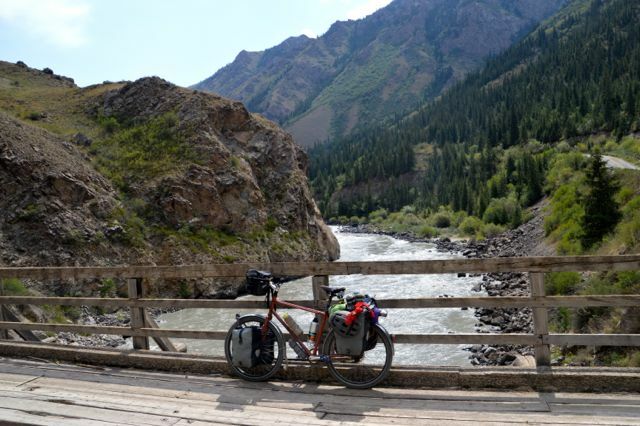 We had some lunch and coffee and eventually hit the road again, our panniers bursting with food for the next leg. After another 20km cycling along the beautiful lakeshore, resisting the urge to make camp and go for a swim, we turned off and headed south. 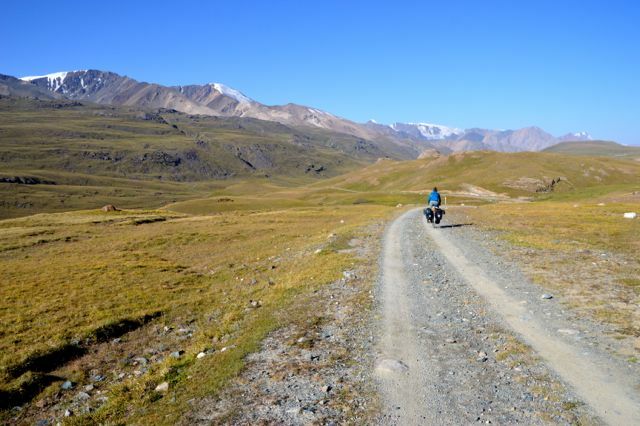 This was the road that would take us from around 1600m to 4000m in 30km. Well, we thought it was the road. Our map said so but google maps was silent on the matter. We decided to chance it. From here the road deteriorated significantly. It was now a rocky stone path, following a river up a valley. Not long and we were climbing, then pushing our bikes. It reminded us a bit of the Savannah Way. After only 3km (in 1.5 hours) we stopped and made camp high above the river. 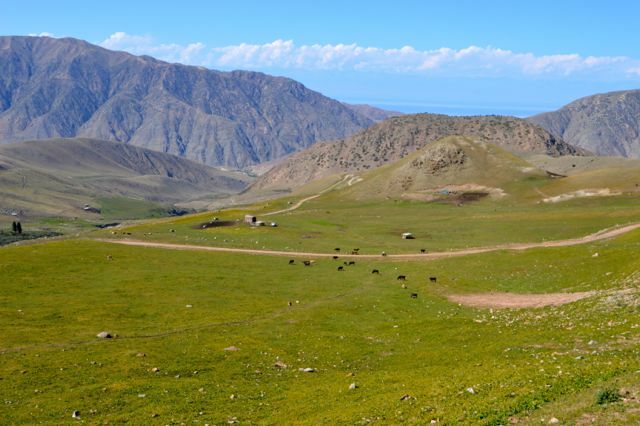 While cooking dinner a young boy herding his goats and sheep came passed. He had one goat that was his obvious favourite and it was very tame. It cuddled up to him and when we shared out biscuits with him, he in turn shared them with his goat. Later we made a fire and the shepherd boy came back down and gave us gifts of ‘Keffier’ (yogurt) and delicious Apricot jam. So much kindness. The climbing continued up the rocky, narrow road. In the distance we could see the icy gleam of the glaciers and the pass. 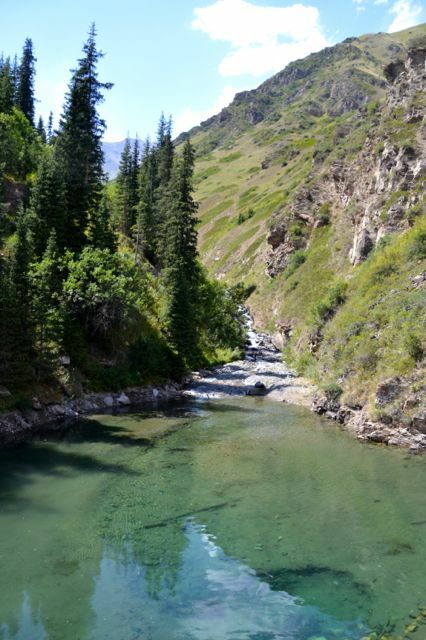 After a few hours (but not many km’s) we found ourselves in a wider valley where we sat ourselves down on the soft green grass beside a crystal clear river. This was paradise. It was also where the road forked. 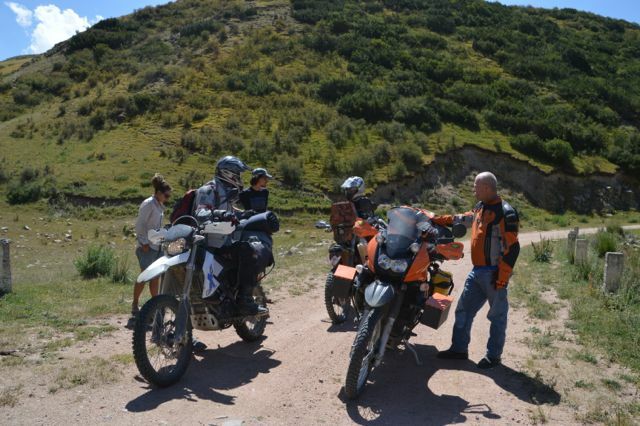 Luckily we found a few people to ask and it was confirmed that we were indeed on the correct road to Naryn. Upwards we continued to go, sometimes cycling, sometimes pushing, sometimes falling off. 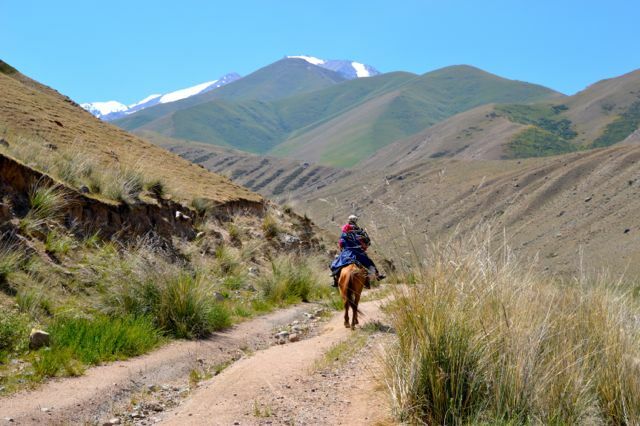 Switch back after switchback, we climbed passed nomads with their animals, yurts and slightly intoxicated locals riding their horses (with the wife on the back) to some remote mountain dwelling. I sure wished I could trade my awkward heavy bike for a nimble mountain horse a few times! Which way to we go? With Neil’s encouragement we have become even more tea obsessed and take every opportunity to brew a cup. While we were enjoying a break and a cuppa, a family in a 4wd pulled up. Their son spoke excellent English, making sure we were okay and then gifting us fresh (made that morning) butter, and eggs. We had a delicious lunch. Some Western motorcyclists also stopped, giving us valuable information about the road ahead (it was going to get worse) and details about a good place to camp. 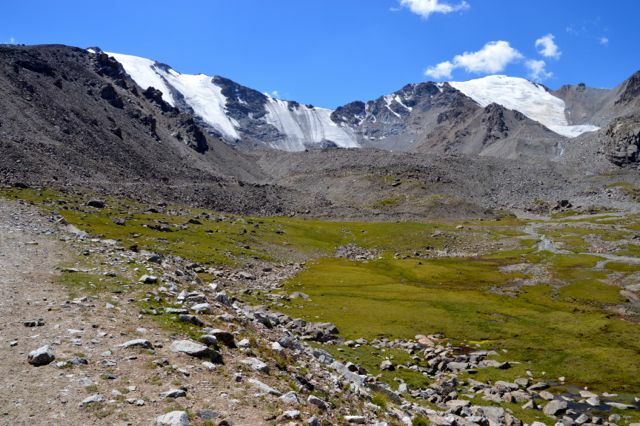 We continued on and the altitude began to affect me, mainly because I was a bit sick. I found myself stopping every few minutes and just wishing I could lie down. 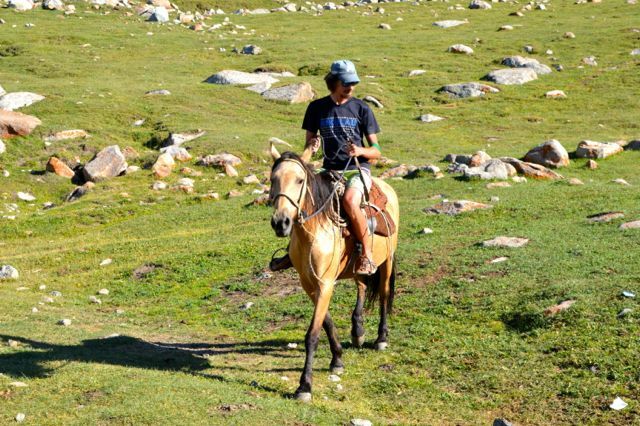 Finally after what seemed like eternity, Neil came towards me on a horse! He offered me the horse in exchange for the green fairy, a good deal for me. 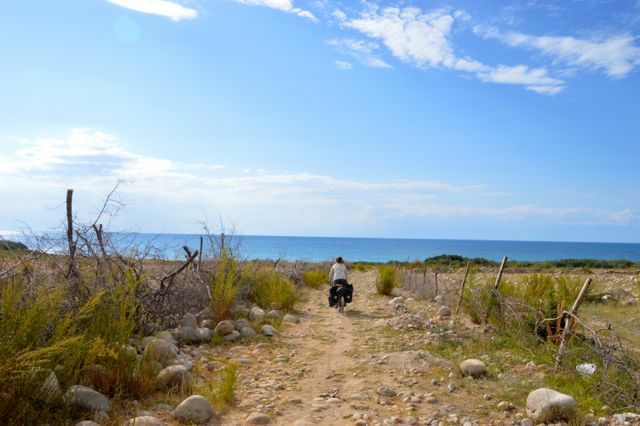 I rode the remaining short distance to our camp and it made me realise I miss horses and riding a lot. The horse had come courtesy of some nomad children who watched us set up camp and later came down to share some Kemez (fermented horse milk) with us. 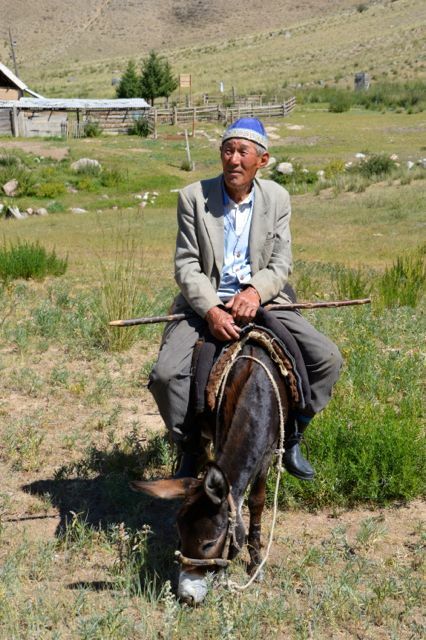 It’s the national drink of Kyrgyzstan and the Kyrygz seem to love it and drink it in huge quantities. I thought it was okay in a small dose. A very small dose. This is a good deal for me. It feels like home. 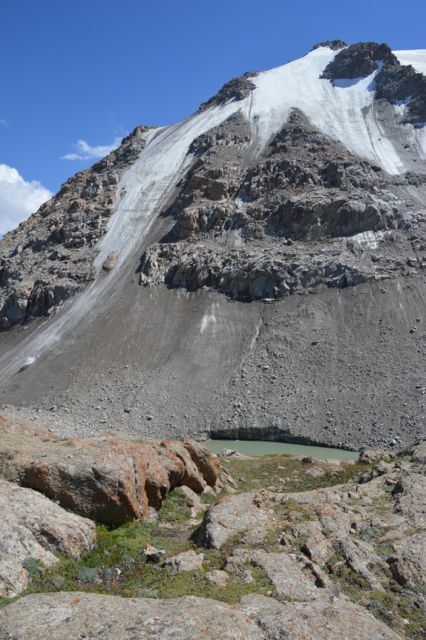 Our camp spot, the glaciers don’t look too far away now.. 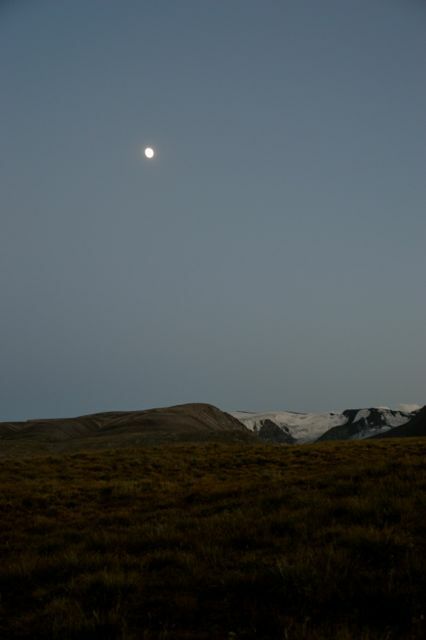 Morning brought hot tea as the sun slowly came over the mountain, illuminating us and the glaciers not so far above. The extremely slow ascent continued. 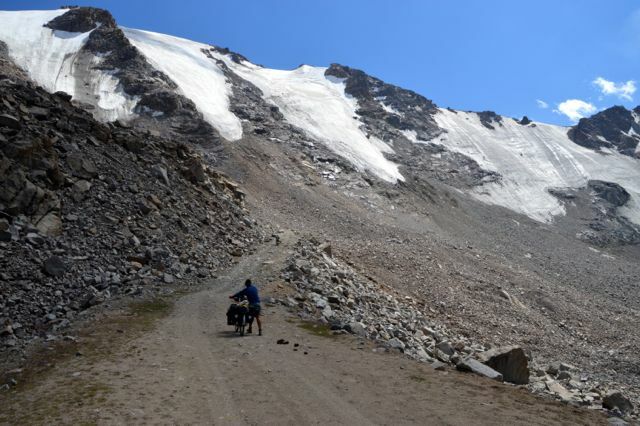 We were basically hiking with bikes as large boulders obscured the road. It was like trying to cycle up a dry river bed. At times two people were needed to push the bikes up a particularly steep section. 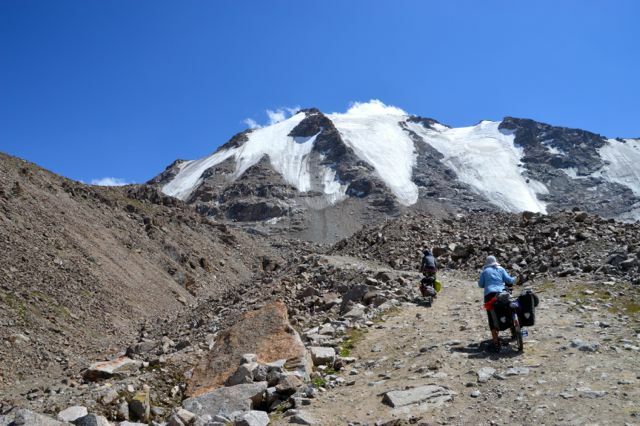 Finally, after hours we reached the top, the glaciers were so close now. We could here them crack and groan in the sun, rocks occasionally avalanching down to earth. It was just ice and rock up there, stark and beautiful and somehow very alive. 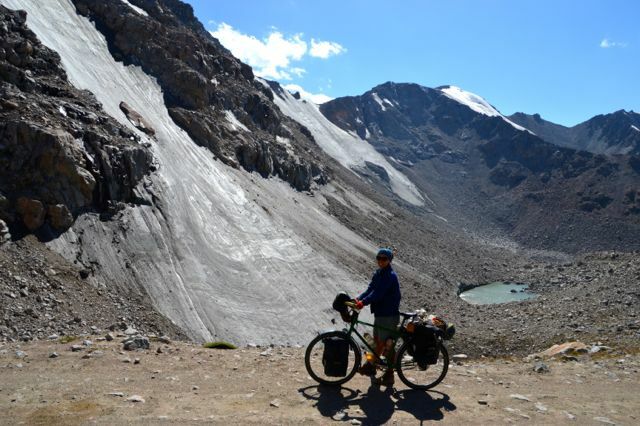 After some time resting and staring at glaciers we were joined by an eccentric German on a girls bike (basket and all). 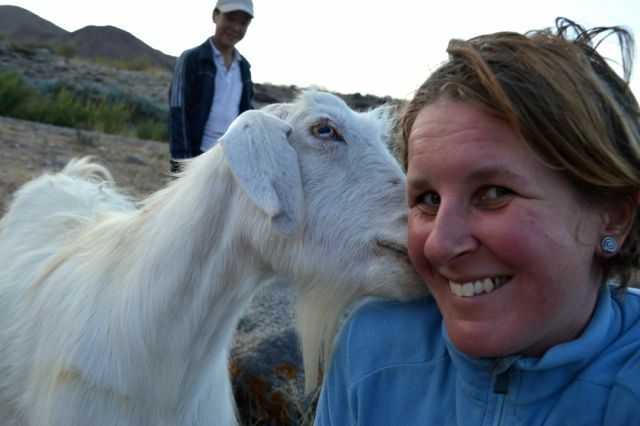 You meet all kinds of people on the top of 4000m passes! Oh yes they are YAKS!! And we push up and up.. The descent was predictably rocky (I spent a lot of time pretending I was on a mountain bike, probably going way too fast) and the valley that opened up before us was just about the most beautiful thing I had seen. I thought the valley we had just cycled up was amazing, but this just took it to a whole new level. 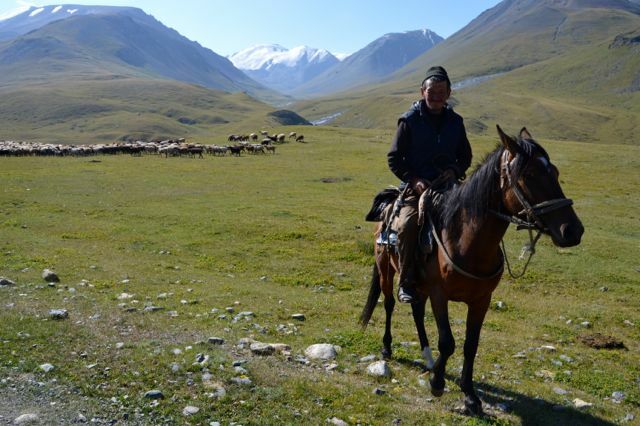 Alpine grasslands stretched out before us, dotted with yurts and horses. 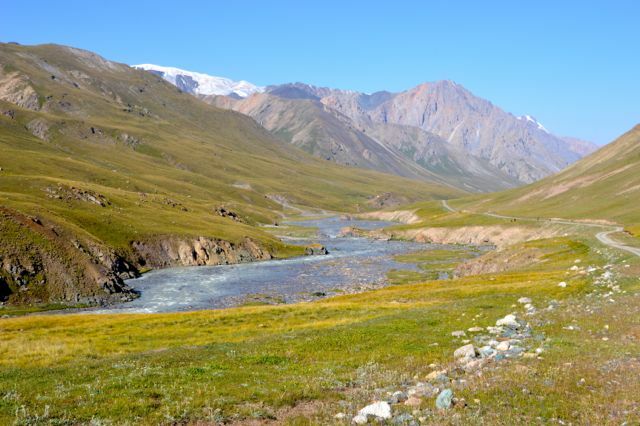 A huge river cut through the landscape and immense snow capped mountains towered above us. Every view was breathtaking. 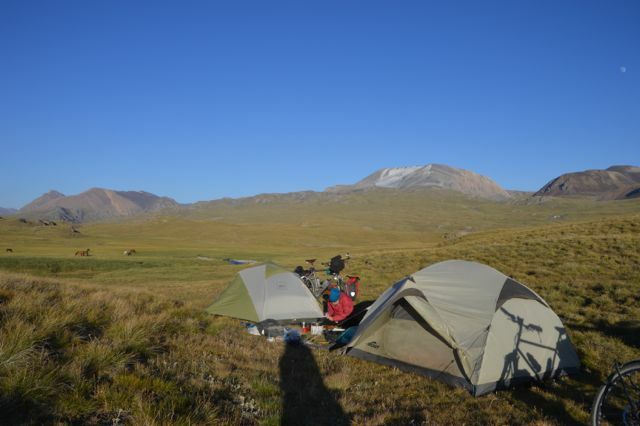 After another hour or so and a whopping 18km total for the day, we made camp beside a small stream on some soft grass. As I lay in the tent later on, the light fading, I could hear the thunder of the semi wild horses hooves as they galloped across the grass just behind the tent. Relieved to have made it! And on the other side the view is equally awesome! We woke to frozen water bottles and ice on the tent. Hot tea and porridge soon sorted us out and we hit the road in high spirits. Although slightly better, it was still slow going. The road had been washed away in many places and more than a few icy river crossings were encountered. We also came across many cyclists; some on self supported tours, some on mountain bikes and one group that was racing. A few ancient 4×4 Lada’s also rattled by, but all in all we had the road mainly to ourselves. 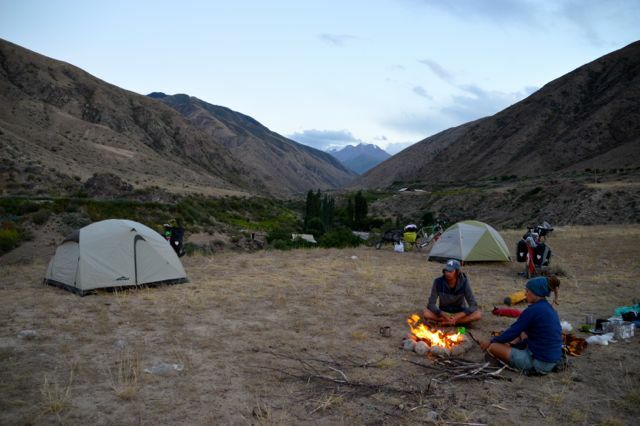 In the afternoon the landscape changed and we entered a dry rocky canyon, and made camp high above the river. A few cold river crossings! By the next day our supplies were running low and we all began to fantasise about the Magazin (shop) that we knew lay ahead. Unfortunately it was Saturday and no one felt like opening it. We continued on. Being lower now, it began to get warm and we stopped to dip in the freezing water to wash. We were all rather smelly. After a morning of undulating through the canyon we entered yet another breathtaking valley, villages and snow capped mountains on the horizon. It was about this time that the green fairy decided to get a flat. While fixing it, a lady invited us in for ‘chai’ (tea). We happily accepted, curious to see what the inside of the houses looked like and grateful for the offer of tea. Well, it was here that we learnt that chai actually means EVERYTHING. Bread, fresh cream, homemade jam, Kemez and actual tea. It was amazing and delicious. We were then shown around the house and we got a sense of how cold it must get in winter. The walls were thick mudbrick, the insides lined with carpets, the windows double panned. The houses were old, electricity an obvious later add on, but the building quality was impressive. Finally we bade farewell to our host and her family and headed to the small magazin in town. By now the road had improved and we made good time down the valley. 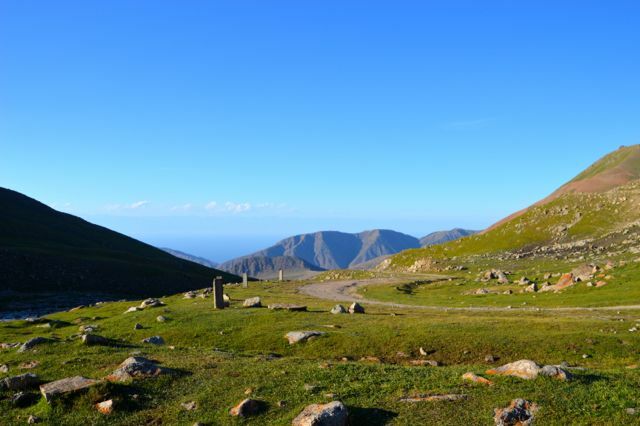 The landscape slowly changed as we dropped lower – christmas trees! Just as dusk was beginning to hint at her presence who should we come across but Remi and Rebecca (who we had met in Osh) cycling the opposite way. 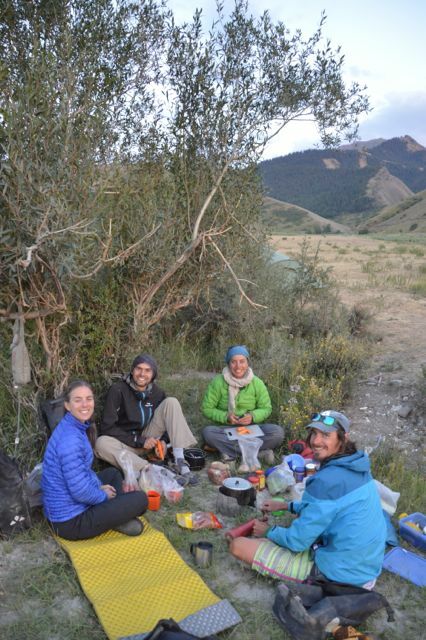 A reunion ensued and we quickly made plans to camp together that night. 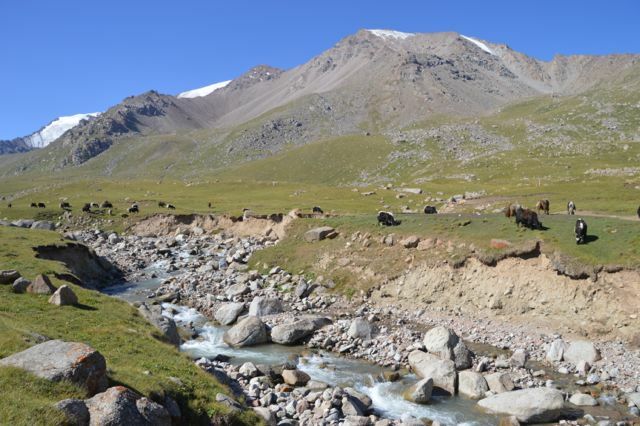 Being Kyrgyzstan it took about 5 mins to find a sheltered camp by a stream and it was here we sat, talking and cooking and sharing stories from the road. 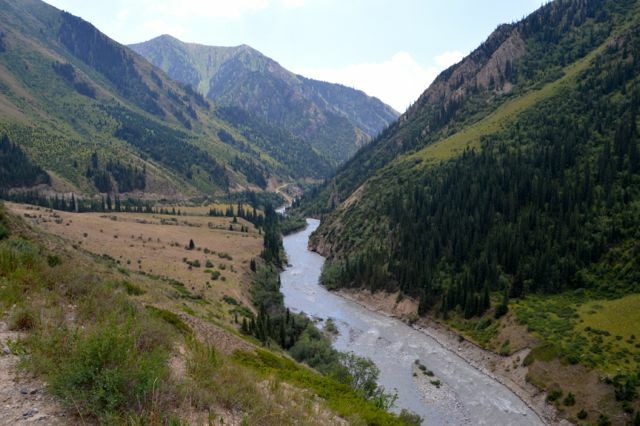 With warnings about the quality of the road ahead (and the awesomeness of the views), we left Remi and Rebecca and headed the short distance into Naryn, a medium sized town. 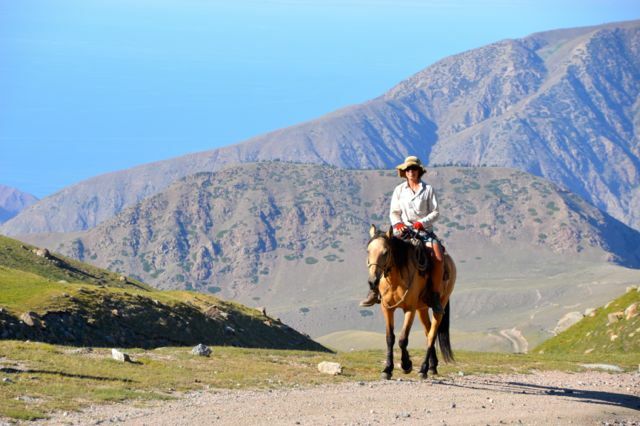 Another great aspect of travel in Kyrgyzstan is CBT (community based tourism) which offers a network of homestays and other services. 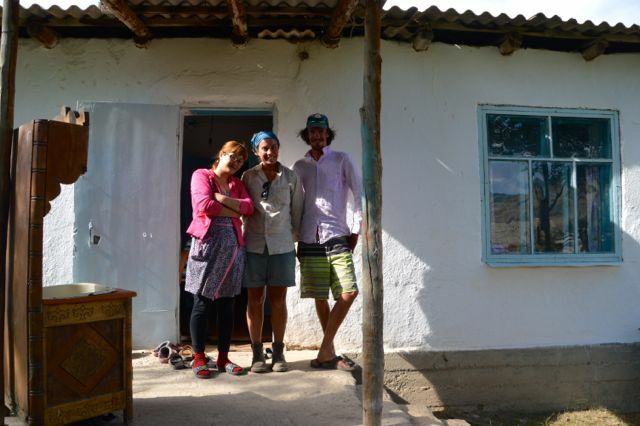 In Naryn they have an office offering free wifi and advice from the tireless Gulvira. 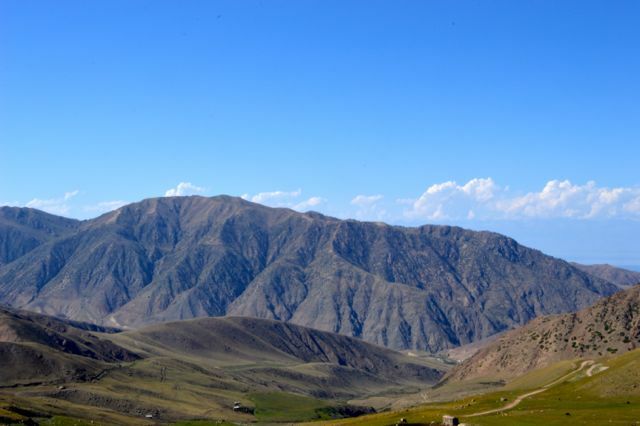 It was here that we came face to face with fact that we had been unable to do enough kilometres as well as the poor nature of Kyrgyzstan’s infrastructure. And the “Green Mumba” (aka a South African passport). Poor Neil is one of the only nationalities that we know of that needs a visa for Kyrgyzstan. 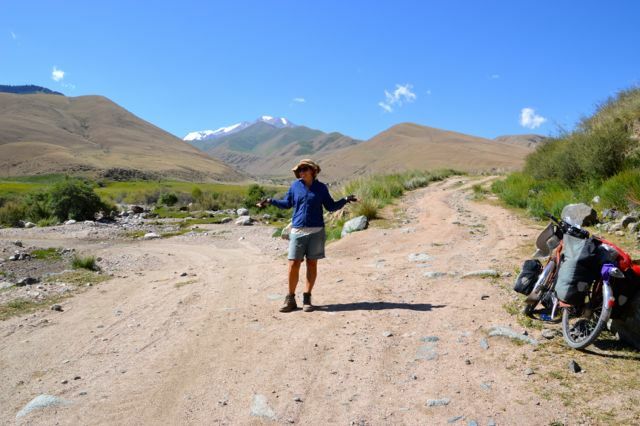 As he only had a one month visa (as apposed to our 60 or even 90 day entry stamp) and the fact that our Tajik visa’s were starting soon, we did not have enough time to cycle on the apparently mostly awful roads back to Osh. We then found out it was going to cost us over US $100 to cut off the worst 200km. Ahhhh! 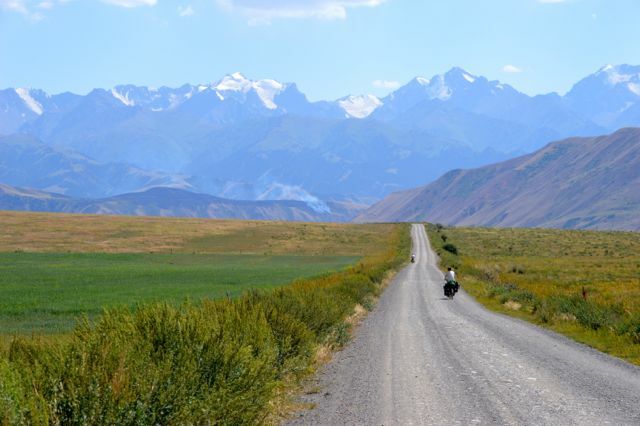 After some discussion we conceded to taking the night bus to Bishkek and then a car to Osh. It was going to be 24 hours of travelling hell. That night however we stayed at Gulvira’s lovely flat because all the other homestays were full. She was wonderful and it was great to get to talk to someone about life in Kyrgyzstan. After a day of catching up on emails we boarded the night bus for Bishkek. 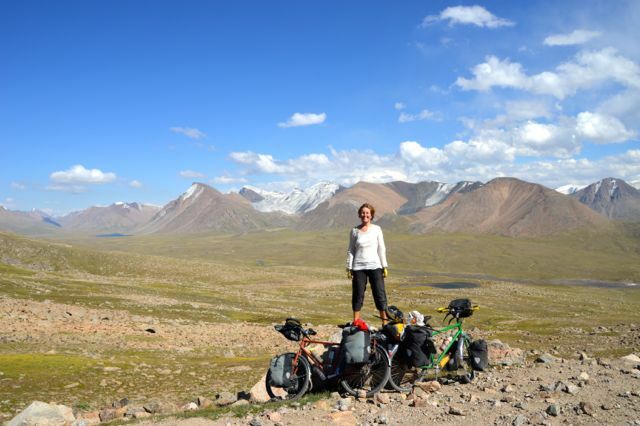 Predictably we had to argue over the price of the bikes (even though there was hardly any luggage in the bus) and Gulvira once again came to our aid. The bus ride was a bit uncomfortable and we arrived bleary eyed back in Bishkek. It was still really early and the only driver we found appeared to be drunk (or so fatigued he seemed drunk) so we decided to wait it out with coffee (and hope for a Muslim driver who wouldn’t be drunk!). Lucky we did. Soon a man came and found us, a reasonable price was negotiated and our bikes were loaded onto the roof. Soon more passengers where found and then we left for Osh. Our driver was a Muslim and a true legend. Not only was he a careful driver, he also lent us money (as we had been unable to get any out) and treated us like family. In fact, the whole atmosphere in the car was one of instant family. The drive itself is long, hot and cramped (and I really don’t want to do it ever again) but the people do make up for the discomforts. Once in Osh our driver even rang the Guesthouse (as it was really late) to make sure we had a place to stay. 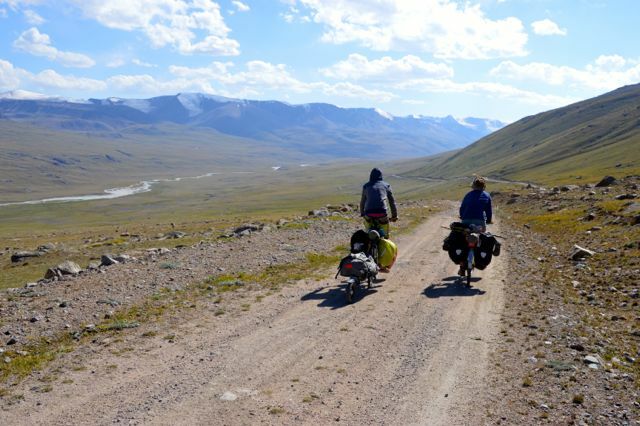 We bade farewell to our friendly companions and cycled the short distance back to TES Guesthouse and predictably headed straight for the beer fridge. It had been 24 hours on the road without sleep but we had arrived. 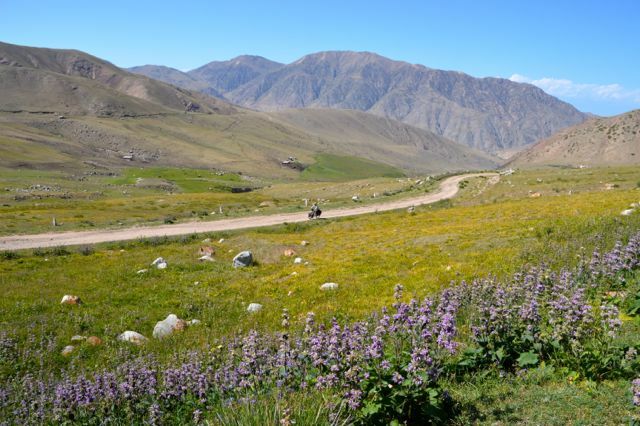 The Pamir Highway was only days away..